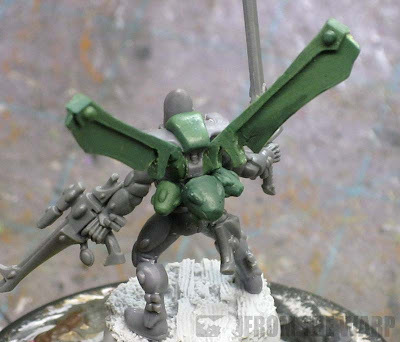 Trying to convert a regular Eldar Guardian model into a Corsair has been a challenge. It's a fairly involved process to get one, but once you have the first one done, you could probably make squad of these guys in no time at all. Forge World's conversion kit was the inspiration for this model and with the release of IA11, I decided to give it a go to see if it was something I could pull off. I knew I wanted to copy the Forge World example. The other big part to this whole thing was trying to keep it simple enough that it could be reproduced to create a squad. That meant leaving some things out and shortcutting where appropriate. I have to say I cheated in one respect and that's the weapon. I opted to go with a squad leader instead of a regular troop so that I didn't have to try and build the weapon they hold. Aside from enough Guardian bodies to make up the members of your squad and the weapons they'll be kitted with, you're going to need a few more things. All your sculpting tools, superglue, etc. Painting: Other than the little bit of background I picked out of the Eldar codex, I don't know much about these guys. I certainly don't know about their color schemes. To that end, I copied the one from Forge World when it came time to paint him. Casting: You'll need to be fairly comfortable with greenstuff and casting smaller bits in order to make the wings. 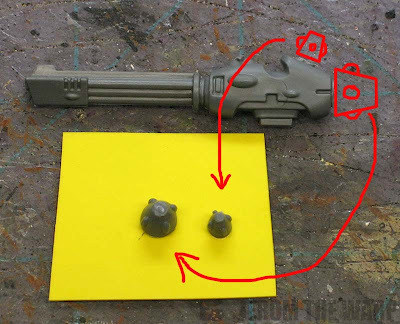 They aren't impossible to do, but they are kind of tricky and are a little more work than just making a simple press mold of a flat vehicle icon. These are what set these guys apart from the rest of the Edlar. Sure they have different guns, but the wings really do it. I knew these were going to be the biggest challenge. At first, I thought I could make them all from plasticard as I needed to, but quickly realized this wouldn't work. Enter casting. After I made one, I was able to make a mold of it and then cast my wings successfully out of greenstuff. That meant two things for me. 1. I could produce these on a scale large enough to equip a squad of these guys without spending the rest of my life making each individual wing. 2. The wings would be consistent enough visually so they would read as being real and correct and not cobbled together on an individual basis. Sure they are the focus of the model, but you need them to look correct enough that readers skip over them and assume they are real. I started by figuring out how to break down the wing into something managable that I could build out of plasticard. I decided on a three layer approach. This would give me the thickness overall I needed and then still be able to have the actual "wing" portion thinner on the inside of the piece. The picture above shows how I did it. I sketched out what I thought was the correct shape of the wing based on the Forge World pictures and then transferred that over to my plasticard stack (piece #1). 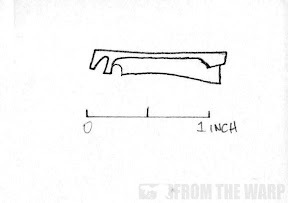 The image above is what I came up with for the shape of the wing. It's close enough for my work, but feel free to download it an modify it to fit your needs. 1. Draw out your wing shape and cut out your 3 plasticard strips. 2. 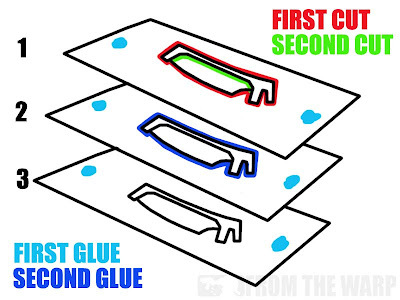 Glue your plasticard strips together (First glue, light blue dots). 3. 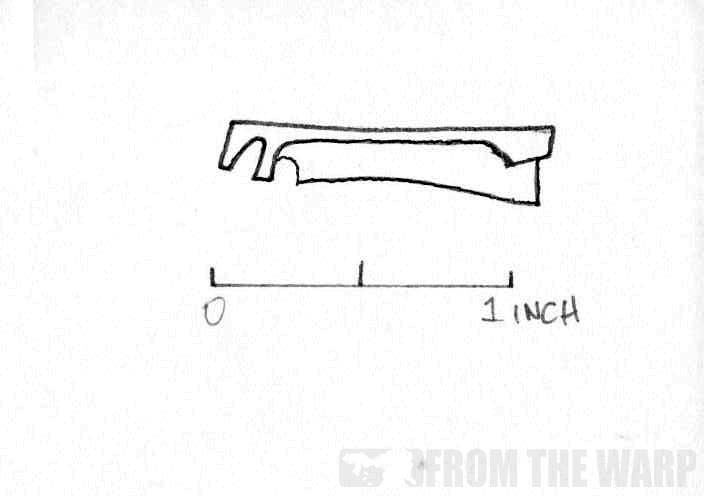 Transfer your drawing over to the top of piece #1. Note: you'll need to be very careful here since as you cut out your whole wing from the plasticard (and you'll need to cut through all three pieces slowly) your wing will want to fall apart since there is no glue holding it together. Take your time and hold them it together. You can't glue it together until the next step is done. 5. 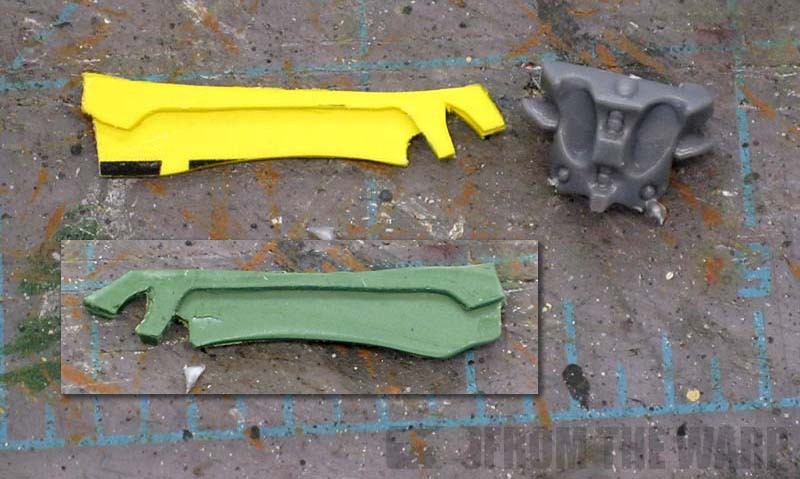 Cut out the the wing itself from piece #1 and piece #3 ONLY (Second cut, light green line). This will create the thinner wing blade set within the thicker arm supporting it across the top. 6. 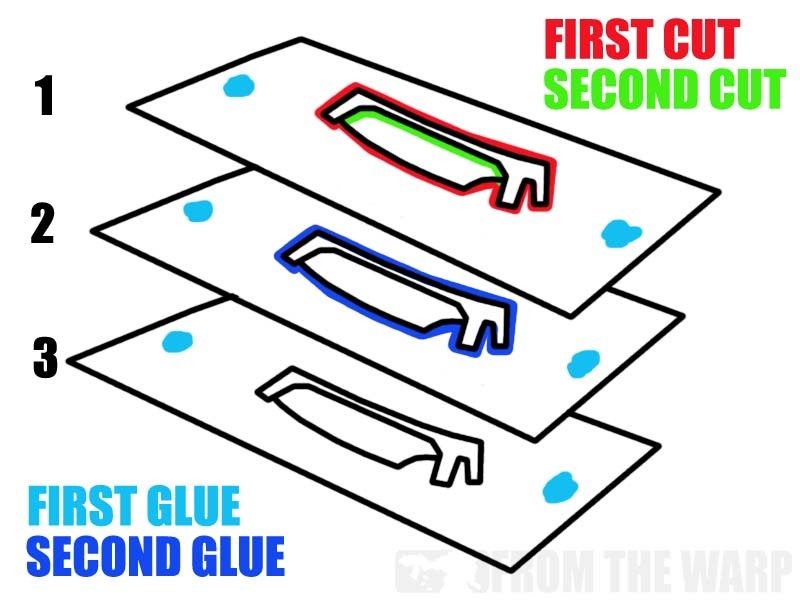 Now carefully add glue to the edges of your whole wing and allow it to seep in between the three pieces gluing them all together into one solid piece (Second glue, dark blue). 7. Once everything is dry, take your file or X-Acto blade or file and clean up the rough edges left over on your whole wing. 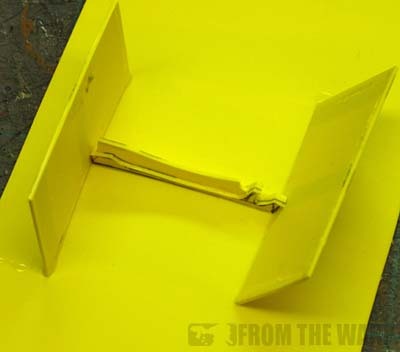 You need to make this one wing as smooth and clean as possible since it will be what you use to make the master mold from. Note: Some of you may be wondering about the gems on the ends of the wing tips. Those are added with small blobs of greenstuff sculpted into place at the very end. Your mold will NOT have them so that it's easier to do. This is fairly easy to do actually. 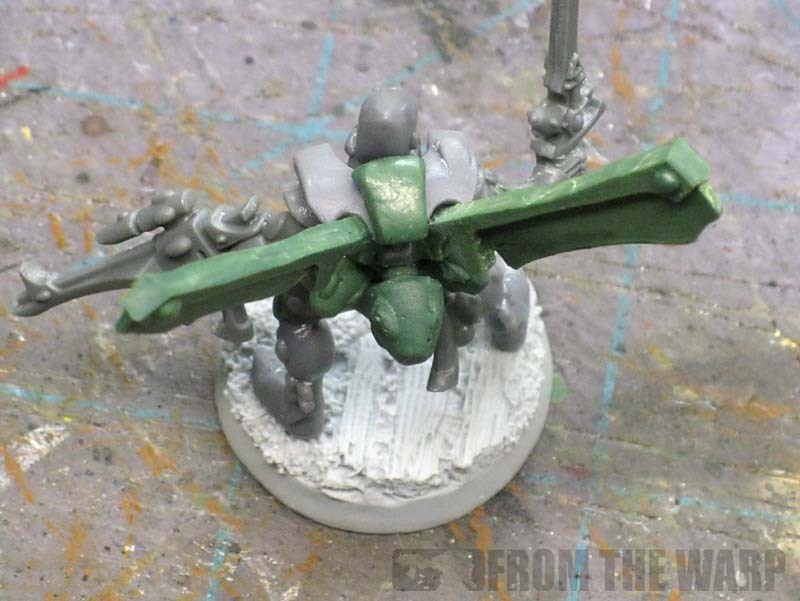 You'll need a few larger pieces of plasticard to build your framework around your whole wing and some Blu-Stuff. Glue your wing upside down onto a piece of plasticard. You can bend the piece slightly so it fits nice and snug to your wing. You don't want any gaps. The reason we're using the plasticard is so our Blu-Stuff doesn't go all over the place when we make our mold and we can create an artificial edge that just needs to be trimmed up in the end. Glue two more pieces on each end at the angle so they are flush with the wing ends. Now use your Blu-Stuff to make your mold. Make sure you get all the way around your wing and make the overall mold fairly thick. Remember, there will be a thin wing inside of it that will need to be supported as we make our casts later on. And here is what a finished (and cleaned up) cast of a wing should look like. Remember, it's still missing the gems at the ends since we don't cast them, but add them now with tiny blobs of greenstuff. 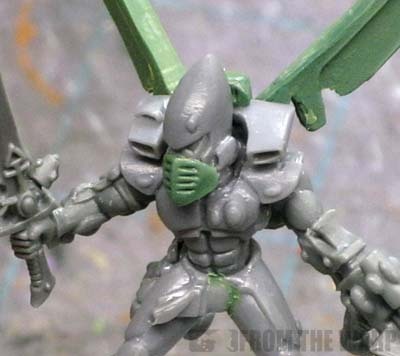 The rest of the conversion is made up with the helmet modification and the vents added to his back to create the look of the backpack he's wearing. The helmet is easy enough to do. Starting with a regular Guardian head, it's just a blob of greenstuff that is pressed into place, given a rough shape and then the vent cuts are added across the front. Don't try and get a perfect shape to the mask the first time. You really only need to get close. Once it cures, you can go back in with your blade and cut it to the perfect shape. Just make sure the ridge running down the middle (along the nose) in the front is nice and straight. The backpack involves one last bit of casting. You'll need that spare Scatter laser for this. Cut the big and little nubs off the back of the weapon and glue them down to a piece of plasticard. Make sure they are nice and clean and there is no undercut where they are glued down. Clean the bottoms off until they rest flat on the plasticard. These will be simple press molds. You'll need one big one and two small ones for each backpack. When it comes time to attach them to the model, the big vent will need a short spacer to make it stick out enough. That's done easily enough with a short piece of greenstuff that has cured. I have some spare greenstuff sausages lying around and I cut off a short section to glue into place. The large vent is glued right onto that. The two smaller vents are glued directly onto the back of the torso. You'll want to make sure the surface is clean and as smooth as possible, but they should just glue right in place without any troubles. The one last part to this whole thing is a vent that runs over the top of the shoulders and sits behind the helmet. It's easy enough to sculpt in place right onto the shoulderpads before you glue the helmet into position. All this does is give his shoulders a different profile and helps give the illusion he's wearing a different style backpack. And here we have a final look from up above. You can see how the wings are just glued into the torso back on the flat areas. They can be positioned at whatever angle you think looks best. 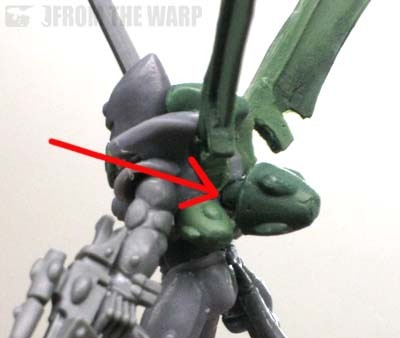 If you really want to seal the deal, take a small amount of greenstuff and fill in any gaps left over right around the wing where it attaches to the torso. You can see how the three vents are positioned in place and the how the top shoulderpad vent looks as well. This is all there is. The backpack, which takes the most work by far and the modification to the helmet. Outside of that, this guy is a regular Guardian. When you are making your wings, make sure to let them cure completely before attempting to remove them from the mold. I'd say overnight so that as you go to pull your wing out, you don't deform or tear it... remember it's fairly thin and can be damaged easily until it's cured completely. I know this seems like a ton of work, but you only have to make one wing and then you can start casting. All the work is on the front end. Once you get that one good wing built, the rest goes fast. I love the way these guys look too. They stand out from the regular Eldar models and would make for a great looking squad on the tabletop. I don't know about their rules, but I never see these guys used and just seeing them out there would be so cool. Here's the post with pics of the painted model. Holy cow, that's simply awesome work Ron! Love how it turned out - I really need to pick up some Blu-Stuff and give it a try. Nicely done! Wow, amazing work Ron! Can't wait to see this painted. Glad you like it guys. It was scheduled for tomorrow, but Blogger posted it today for some reason. I guess I'll post the painted pics tomorrow then. Kinda makes me think of Insecticons, but I love it! Totally awesome! 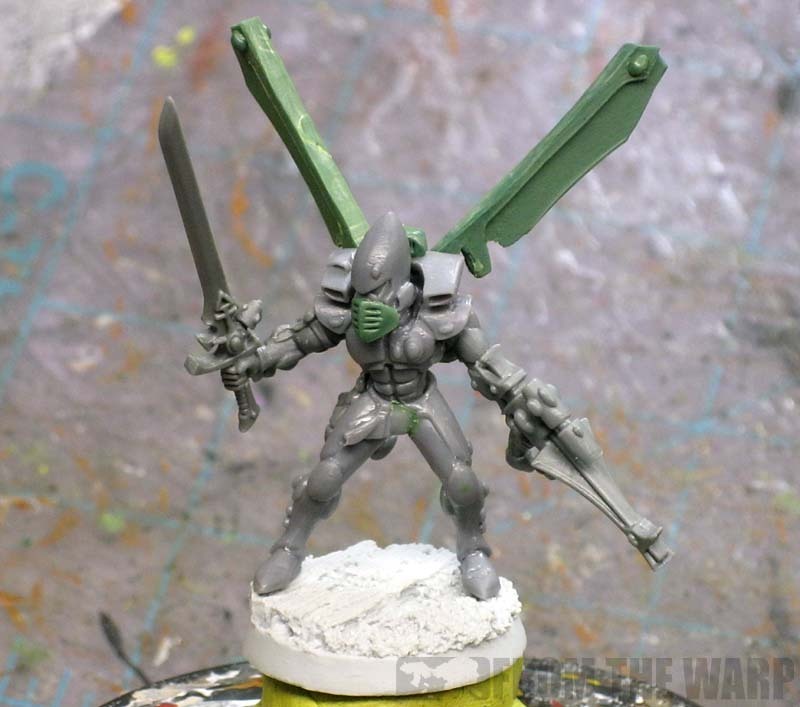 It actaully makes me sorta want to work on some for my Eldar... hmmmmm. Thanks guys. This conversion is a bit more involved than most I post up, but it's all to get that one wing built. After that, it's relatively easy.